Hey guys, it’s Zenthanith here once again. Pls join me in welcoming a new editor to the team, Avis! Thank you guys so much for your support and please keep it up! Hope you guys have fun reading it! Suddenly, as the man sent a punch towards Su Yi, a green light sparkled from within the tree cave which was hidden by green vines and a streak of light shot out as fast as lightning, exuding a presence like that of thunder within a storm. It was all too quick. There was only a flash of green and then a wide blood-red gaping jaw appeared. The man who was attacking Su Yi did not manage to react in time and was swallowed head-first by the open jaw of the snake. When the other two men realized what was happening, it was already too late for them to rescue the man. All that was left of that muscle-packed man was a pair of feet dangling outside the snake’s mouth as fresh blood ran down the sides of its jaw with cries of despair echoing in the air. The other two men shivered. They were really shocked, never did they expect a Green Jade Python to come shooting out from the brat’s back. Initially, when they had seen the brat take out the White Jade Fungi, they assumed that the snake was not around or had already been killed. They never expected an ambush by the snake. But even if it was attacking them, shouldn’t it swallow the brat first? The eyes of the snake glimmered with cold light. It recognized the three men in front of it. They were the ones who had injured it not too long ago and now that it had seen its enemies, it was not going to let them off. Theoretically, for a Green Jade Python to be able to swallow a Yuan Soul Realm cultivator who was at the Peak of Ninth Grade should be slightly difficult. But the snake had launched a surprise attack, totally out of the man’s expectations, hence it turned into a one shot, one kill. And now all that was left were the two men which it was not at all afraid of. Su Yi looked at the shocked leader of the group. A cold light emanated from his eyes. With the Green Jade Python present, he was not afraid of the men cooperating and trying to kill him. “This beast listens to your orders?” Looking at the snake who was slithering about besides Su Yi, the leading man finally understood the situation. It seemed that the Green Jade Python listened to the brat’s orders. This fact made the leading man shake. This was way too weird, how could this brat know how to control beasts? “Take a guess.” Su Yi looked at the man and smiled slightly. “Okay!” The other alive man, who was skinny and tall, took a deep breath. Even though he knew it would be hard for him to take on the Green Jade Python, the snake was already injured. If he needed to distract the snake for a while, there should not be any problem. His companion, who was around the same cultivation level as him, was swallowed in an instant due to a moment’s carelessness. The leader had a feeling that Su Yi was special. It could be said that this brat, who was still wet behind the ears, came to the Forest of Demons to search for treasures. He could also be an important disciple from a large Sect or School. But from how abnormal this kid was, it would most likely be the latter. This was his chance! If he could get some stuff from the kid, he would have struck a fortune and from here on out, he would be able to live a good life! Become a person above others! A life where he would get whatever he wanted! Thinking about this future, greed consumed his thoughts. The leader stared at Su Yi full of bloodlust. Su Yi raised his eyes. He felt the thick bloodlust emanating from the person in front of him and within the depths of his eyes, the same amount of bloodlust swirled within. The leader could not wait any longer and made his move. 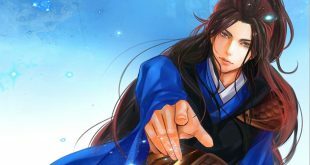 As his feet stepped forth, a golden-colored Yuan Qi burst out from him and his figure quickly dashed forward, slashing the ringed saber in his hand towards Su Yi in the fiercest manner possible. But at this time, the Green Jade Python shot forth once again. As that gigantic figure towered above them, it swung its giant tail, sending a hail of rocks and sand towards the two men. A violent wind blew at the impact. When facing the Green Jade Python, not even the leading man dared to take it head-on. Before getting hit by the violent wind, there was a movement of golden Yuan Qi beneath his feet and his body dodged the attack like an eel. His body technique may not be high leveled, but he definitely proved that he had the experience to make up for it. The skinny tall man took action. Although there was fear in his eyes, his face was cold and fierce. He held a weapon in his hand. It was like a spear yet not a spear, like a halberd, yet not a halberd. A faint black colored Yuan Qi of the Earth attribute swirled around him as he intercepted the snake. Sneering, a cold light flashed across the leader’s eyes as he raised his ringed saber. It reflected a chilling light and with a gust of wind, he mercilessly brought the blade down on Su Yi. The sharp wind, which accompanied the blade, slightly stung Su Yi’s forehead as his hair fluttered about from the incoming wind. Su Yi raised his eyebrow. This man’s ability was far worse than the Young Master of Black Fiend School, but his fierceness and merciless actions were there to make up for it. This was a result of his saber tasting blood all the time. Looking straight at the blade which was coming down on him, Su Yi was not the same as before. White-coloured Yuan Qi moved under his feet and together with the “Hundred Transformations Step”, his figure was like that of a floating speck of dust in the wind as he dodged the blade. The leader was surprised, but his emotion did not appear on his face. With another swing, his saber sliced through the air, gleaming with a merciless light as it changed its course towards Su Yi’s back. Feeling the sharp wind behind him, Su Yi leaped away. This man was ruthless and aggressive, far harder to deal with than the Young Master from Black Fiend School. Yuan Qi burst forth from the soles of Su Yi’s feet as they gathered to form a whirlpool. This was the first time Su Yi had used the “Hundred Transformations Step” to face an opponent. Seeing Su Yi dodging his attack for the second time, the leader’s face started to show his surprise and confusion, but his blade did not stop for a second. The saber technique of the man was not of a high level, but it was quite effective. Sweep, Chop, Stir, Cut, Brush past, press down, Cleave and Dash. They were the simplest moves, but also the most effective ones. But right now, Su Yi was in the zone. Though his cultivation level was slightly lower, with his “Hundred Transformations Step”, he turned the situation around. From his initial somewhat pathetic state to his current state, where he could deal with this situation easily. After all, the “Hundred Transformations Step” was an Emperor Grade Body Technique! Although Su Yi had not cultivated it to its limit, using it to deal with these kinds of people, was more than enough. Furthermore, regarding the level of cultivation, Su Yi’s cultivation level may not be as high as the man he was facing and since the man had entered the Yuan Xuan Realm. He could fully release Yuan Qi resulting in a substantial difference between the Yuan Xuan Realm and the Yuan Soul Realm. But with the Chaotic Yuan Demonic Body from the “Supreme Chaotic Yuan Technique” and the enormous amount of Yuan Qi within him, Su Yi could already fight head on against the Young Master of Black Fiend School when he was in Yuan Soul Realm Third Grade. Now, he was Yuan Soul Realm Sixth Grade and along with the advantages he had, the difference between his cultivation and his enemy’s had greatly shrunk.